and then my niece and her husband came this afternoon and brought our great nephew to visit for a few hours (he is just 2 years old and great fun). So naturally I did not get much work done at the house this week except the grass cutting. I did tackle one of the items from the Master Bedroom ToDo list though. I got my jewellery cleaned. 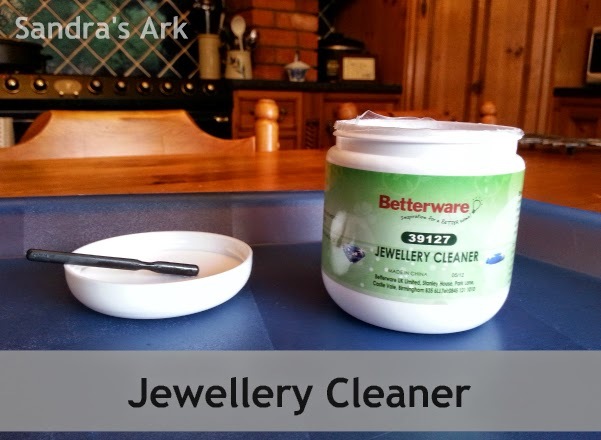 I had bought a Jewellery cleaning solution from BETTERWARE some time ago so got it out on a tray ready to use. The tub is very full of pink liquid and has a little brush included in case the dirt needs some encouragement to be completely removed. Inside the liquid is a small plastic tray with a tall handle. I started off with my goldtone necklaces and placed some of them in the little tray where they just soak in the liquid. Then when they had soaked for long enough I lifted the tray out rinsed the contents under some water and set it on the lid of the container for a little while with the necklaces still in it. 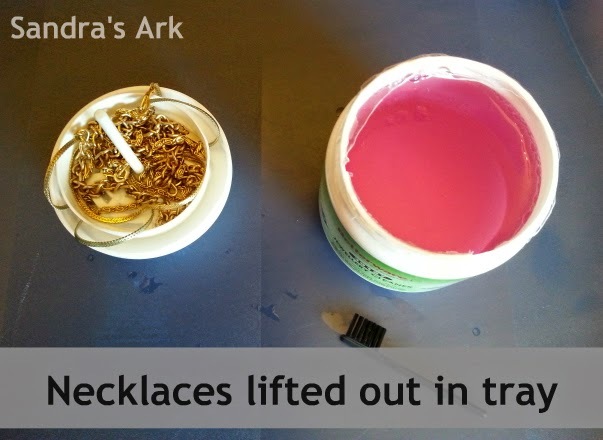 I didn't see any difference in the colour of the solution but I guess my necklaces were not very dirty anyway. Then I set the necklaces on some kitchen roll to dry out and finally gently wiped them dry with a cloth. It did not state how long the jewellery should soak in the solution so I was not sure whether I had done it long enough or too long. I have used other makes of Jewellery cleaners before such as the one from LAKELAND which says a couple of mins so I presumed it would be the same for any of them. So basically it doesn't take long to clean a few items (especially as I mostly put more than one in at a time). However it gets a bit boring if you are like me and decide to clean all your items in the one day. By the end of cleaning all my necklaces, bracelets, rings and earrings there was a definite change in the colour of the solution - it was very grubby looking. 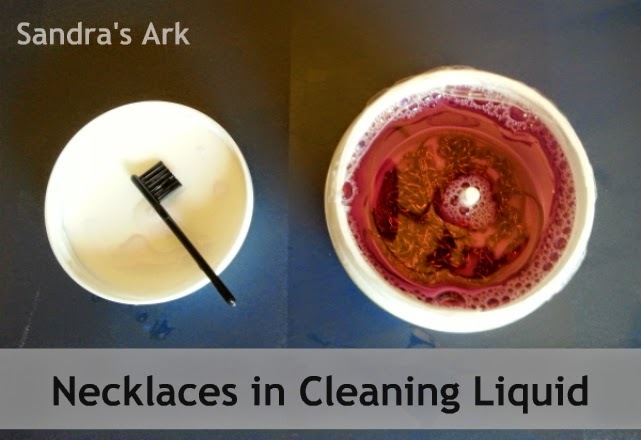 I still had to clean my brooches and I wanted to do some hair clasps as well so I decided I would try out a homemade cleaning solution for them. This blogger had some necklaces which were very dirty and she had obviously tried other means which didn't work but this one did. My jewellery was not in this kind of condition and I reckoned I didn't need the tin foil and the pan so I just made up some of the solution from her recipe and filled up my Betterware container and did the same as before and the rest of my jewellery did just fine. A job well done with my jewellery all sparkling again for another year and it was not hard work. FUNWORK than HOUSEWORK this week. Do you try homemade recipes for housework things? Do you change the recipe to suit yourself or make it easier too? 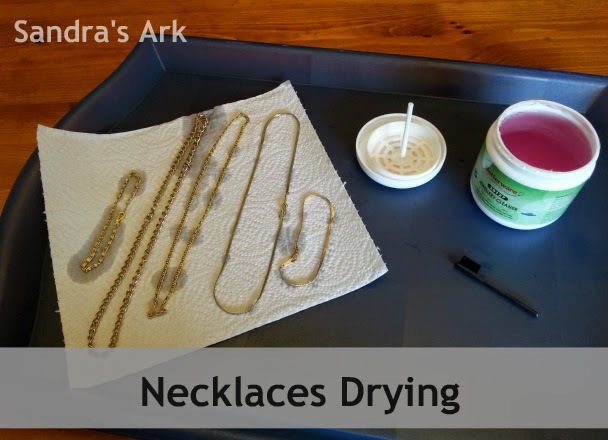 I have never made my own jewelry cleaning solution, we always just take ours in! Oh and GUESS WHAT! YOU are this weeks FRIDAY FAVORITE! Much love girl! Thank you for choosing me as the Friday Favourite. I enjoy the link up. I have a confession. I need to clean my jewelry more often! It's one of those tasks that always seems to slip my mind. Thanks for reminding me and sharing at the NEW #PinFest! Hi Chelsea, it is easy to forget. I even forget where I leave some of my jewellery at times, I think I'm just very forgetful. Hi Jes, Mondays come round real quick don't they. Don't you just love how the jewelry sparkles after the cleaning ~ Great post and shots for S!